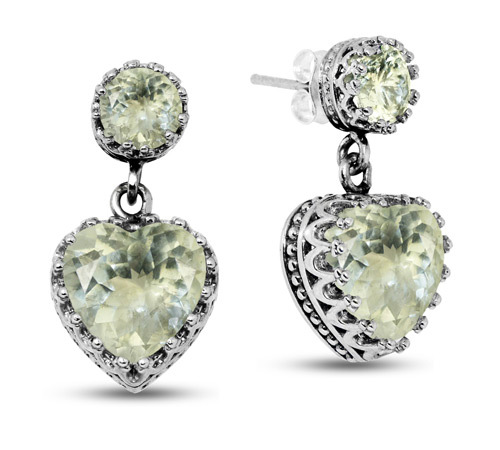 The pale green color of the authentic green amethyst gemstones really stand out in Apples of Gold Jewelry's green amethyst heart dangle earrings with studs. These original and sophisticated earrings combine the traditional stud earrings and the sweet look of the dangle earrings to create a unique look. Set in .925 sterling silver, the stud is a round cut green amethyst gemstone that measures 6mm by 6mm, while the heart dangle is a heart shaped green amethyst gemstone that measures 10mm by 10mm. Each earring is a sweetly sized 3/4 inch by 1/2 inch, making them an ideal pair of earrings to wear for every occasion. We guarantee our Green Amethyst Heart Dangle Earrings with Studs to be high quality, authentic jewelry, as described above.